The advert popup is only accessible by clicking an Advert Tile on the Advert Catalogue page. 1. Advert Popup Menu: Navigate to the other popup tabs here. 2. Full Page View: Open a new browser tab showing a full page version of the advert popup. This is useful if you would like to keep several adverts open at the same time. 3. Crumb trail: Lets you know what you are looking at, either an advert or advertiser. 4. Add To Favourites Button: Click to add this advert to your favourites library. If the heart is red then the advert is already in your library and clicking will remove it. 5. Advert Strength Score: The total number of times we have seen this particular advert. 6. Strength Score By Day Chart: A break down of the number of times we have seen the advert by day. This is useful when determining how well an advert is performing. 10. Reverse image searches: Clicking will open a new tab and perform an image search so you can find similar images from the web. 11. Country Table: This table shows a breakdown of the different countries we have seen an advert in and the % of total views for each. 12. Devices Pie Chart: This chart shows a breakdown of the different devices we have seen the advert on. 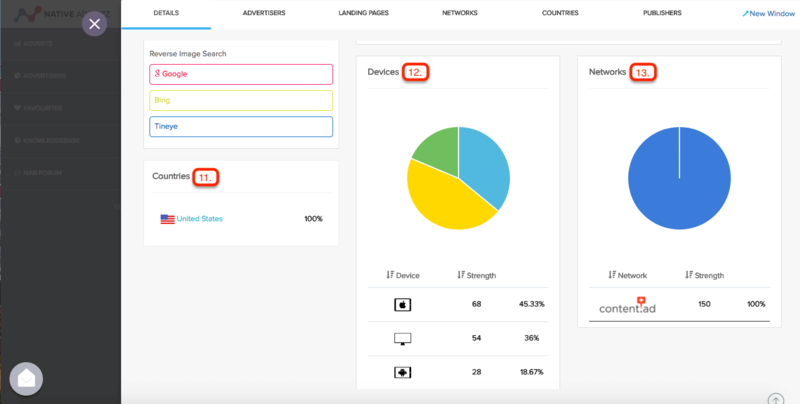 Hovering over a segment reveals the device type, the total number of impressions for that device and the% of total views for the advert. Below the chart the information is shown in a table. 13. Networks Pie Chart: This chart shows a breakdown of the different networks we have seen the advert on. Hovering over a segment reveals the network, the total number of impressions for that network and the % of total views for the advert. Below the chart the information is shown in a table.